Several cobblestone blocks blocking the way in Echo Cavern. Since this subject has no official name, the name Cobblestone block is conjectural. Cobblestone blocks are obstacles found in Hey! 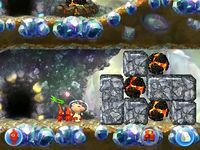 Pikmin, and are rectangular blocks of stone. They can only be destroyed by the explosion of a bomb rock. Their main purpose is to block the way, and they come in several sizes. A tower made out of the blocks, in Echo Cavern. A few long cobblestone blocks, in Secret Spot 10. This page was last edited on February 21, 2019, at 17:53.